For Sale – 1989 fiat panda limited edition 4×4 sisley | Classic Cars HQ. 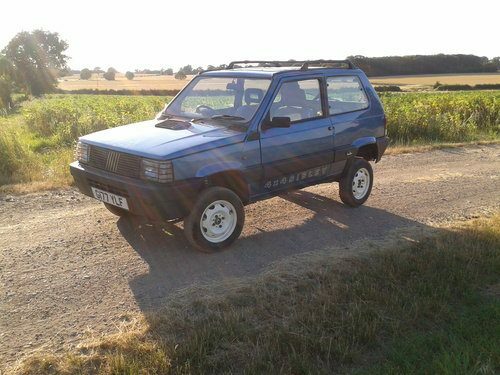 Hi, here I have my Fiat Panda Classic MK1. 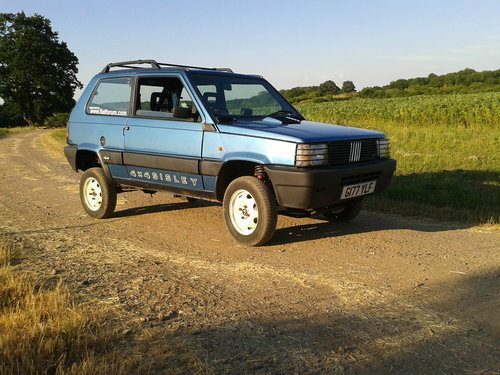 This is the rare 'Sisley' Limited Edition model of the 4X4 Panda. (The model everyone wants!) 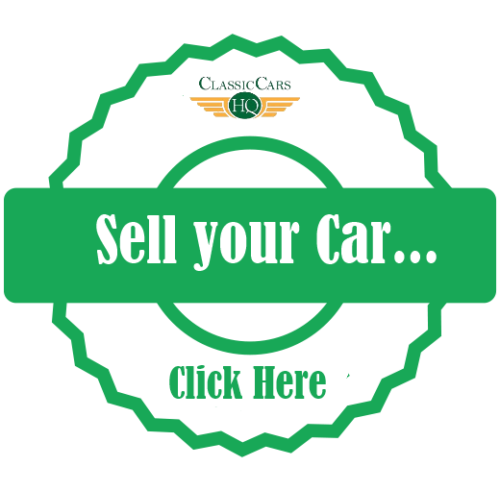 This car has undergone a full and comprehensive restoration programe over the last few years, by both me and the previous owner. I have a folder full of invoices and recipts here, totaling over £8000! Looking at the Panda today, i realy wouldnt be suprised if this was one of the best examples avalible in the UK- it must be the most solid one out there! Right, as the Sisley 4x4 model, the car came from factory with Limited Edition extras; metalic paint, 'Sisley' trim, badges and seats, inclimeter, white steel wheels, roof-rack, bonnet scoop, headlamp-washers... My car has been rebuilt from the ground up, it was stripped to a bare shell, engine removed, and anything it needed it had; - New panels fitted - New doors fitted - All welding undertaken has been done professionly and to top standards- there are no plates slapped over rust etc. - Bare metal full respray in the original blur metallic (inside and out and engine bay) - Full rapture seal underneath and on the inside floors (water-proofing/rust-proofing) - Brand new petrol tank and pipes fitted - Brand new rear leaf-spings fitted - Brand new cam belt fitted - Brand new engine mounts fitted - Full service (new filters and plugs etc) - Brand new exhaust brackets fitted - All new engine gaskets fitted - Brand new rear brake drums, shoes, cylinders fitted - Brand new front brake calipers, disks and pads fitted - All new suspension fitted - Brand new 'Rialzi' 4X4 lift kit fitted (genuine panda 4x4 lift kit brought sprcialy from Italy- over £1000) - All brand new exterior plastic trims and bumpers and decals - 3 sets of refurbed wheels; ~ 4 silver alloys with tyres (couple flat) ~ 5 white steel wheels with fresh paint (new tyres) ~ 5 black steel wheels with fresh paint (no tyres) Included with the Panda, I have v5c logbook in my name, extensive paper history; recipts (over 8k), owners manuals, USB with large restoration photo collection, and a boot full of spare parts. The negative bits; the car has no rear seat (I was going to use the space for a spare set of wheels), although has rear seat belts. 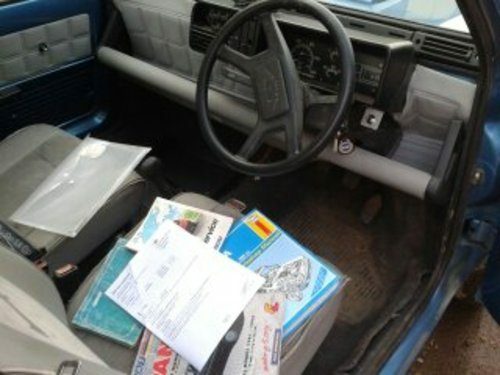 And has no headliner or radio fitted. The Panda flew through her MOT a couple of weeks back, with no advisories (been kept in dry storage since then) As you can see the car has had a lot of money poured into it, and i would love to see it go to a good home, these cars are fast becoming rare and desirable collectors cars, especially in condition like this one. Some would be suprised, they are a very capible off-roader too!